The brachial plexus is divided into Roots, Trunks, Divisions, Cords, and Branches. There are five "terminal" branches and numerous other "pre-terminal" or "collateral" branches that leave the plexus at various points along its length. These six Divisions will regroup to become the three Cords. The Cords are named by their position with respect to the axillary artery. Anatomical illustration of the brachial plexus with areas of roots, trunks, divisions and cords marked. The branches are listed below. Most branch from the cords, but a few branch (indicated in italics) directly from earlier structures. Injury to the brachial plexus can be very problematic because the nerves branching off of the plexus provide innervation to the upper extremity. Clinical signs and symptoms vary with which area of the plexus is involved, and generally result in paralysis or anesthesia. Symptoms can range from transient nerve dysfunction to complete upper extremity weakness. Beacuase of the anatomical variants of the brachial plexus these injuries can be a challenge to diagnose. Brachial plexus injury can occur in a variety of ways and can occur as a result of shoulder trauma, tumours, or inflammation. The rare Parsonage-Turner Syndrome causes brachial plexus inflammation without obvious injury, but with nevertheless disabling symptoms. But in general, brachial plexus lesions can be classified as either traumatic or obstetric. Traumatic injury may arise from penetrating or sports related injuries, falls, work related injuries, radiation therapy and iatrogenic causes (i.e. first rib resection, shoulder surgery, brachial plexus block). However the most common mechanism of injury is a traction injury due to forceful separation of the neck from the shoulder. Common associated injuries can include fractures of the proximal humerus, clavicle, scapula, cervical spine and upper limb vascular injuries. Management of these injuries may complicate the picture when diagnosing brachial plexus injury but can also guide in determining the mechanism of injury. An upper brachial plexus lesion, which occurs from excessive lateral neck flexion away from the shoulder. Most commonly, forceps delivery or falling on the neck at an angle causes upper plexus lesions leading to Erb's Palsy. This type of injury produces a very characteristic sign called Waiter's tip deformity due to loss of the lateral rotators of the shoulder, arm flexors, and hand extensor muscles. Less frequently, the whole brachial plexus lesion occurs. Nerve damage causes a multifaceted clinical picture consisting of sensorimotor disturbances (pain, muscle atrophy, muscle weakness, secondary deformities) as well as reorganization of the Central Nervous System that may be associated with upper limb underuse. Pain is most common, in particular those afecting the preganglionic fibres. Often described as crushing with intermittent severe attacks shooting down the arm. Paralysis and anaesthesia in affected extremity. Bizarre sensations, hyperalgaesia, dysethesia and allodynia. Myoclonic jerks in the affected extremity. Ipsilateral Horners Syndrome with T1 injury. Xray of shoulder area and cervical spine to determine if any boney abnormalities are causing the lesion. MRI will help to visualise causative pathology such as tumors, neuritis, radiation injury. EMG and NCS help to confirm diagnosis, localise lesion and determine degree of axonal loss. These tests are the most useful tests to determine localisation of the plexopathy, especially, the sensory nerve conduction studies (SCSs) because sensory nerve action potential amplitude will decrease in plexopathies due to Wallerian degeneration of the postganglionic sensory fibers. Histamine test to differentiate between pre and postganglionic lesion. Dorsal route entry zone (DREZ) ablation or implantable dorsal route stimulators. This is a great little presentation to teach you the brachial plexus through simplified drawing. ↑ 1.0 1.1 1.2 1.3 TeachMeAnatomy. TeachMeSeries, Educational Health Care Resource. http://teachmeanatomy.info/upper-limb/nerves/brachial-plexus/. (accessed 9 Apr 2017). ↑ Hoppenfeld S. Physical Examination of the Spine and Extremities. CTI Reviews 2014. ↑ 3.0 3.1 3.2 Dutton M. Orthopaedic Examination, Evaluation and Intervention. 2nd Ed. New York: McGraw-Hill, 2008. ↑ Orebaugh SL, Williams BA. 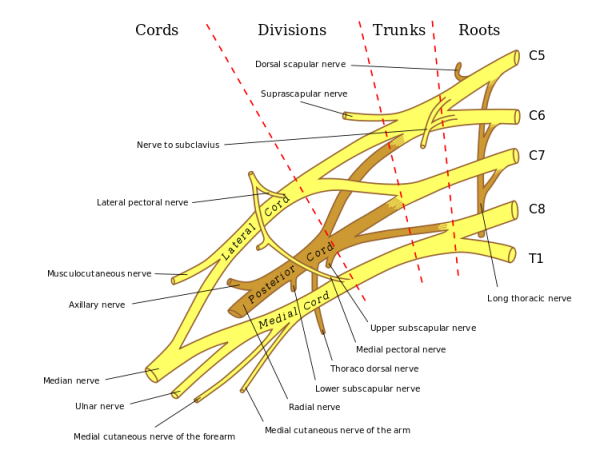 Brachial Plexus Anatomy: Normal and Variant. The Scientific World Journal. 2009;9:300-312. ↑ 6.0 6.1 Coene LN. Mechanisms of brachial plexus lesions. Clinical Neurology and Neurosurgery. 1993;95:24-29. ↑ Higashihara M, Sonoo M. Electrodiagnosis in plexopathies; an update. Rinsho Shinkeigaku. 2012;52(11):1243-5. ↑ 11.0 11.1 11.2 11.3 Sakellariou VI, Badilas NK, Stavropoulos NA, Mazis G, Kotoulas HK, Kyriakopoulos S, et al. 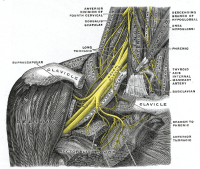 Treatment options for brachial plexus injuries. ISRN Orthop. 2014:314137. doi: 10.1155/2014/314137. ↑ 13.0 13.1 Moore KL, Dalley AF. Clinically Oriented Anatomy, 5th ed. Philadelphia:Lippincott Williams and Wilkins, 2005.